Petunias come in a wide variety of colors. What’s not to like about petunias? These incredibly versatile plants come in an abundance of sensationally bold colors, are widely adaptable, vigorous, self-reliant and largely pest and disease free. They are low maintenance and drought tolerant, available nation-wide, are a great value, sport a variety of forms and colors, and some even exhibit a light, sweet fragrance. Additionally, these fail-proof, tried-and-true beauties are easy to grow, bloom ceaselessly from late spring to fall and settle in comfortably whether planted in gardens, trailing from containers or spilling out of hanging baskets. They’re beautiful, desirable and completely irresistible to butterflies, hummingbirds and gardeners alike. Thanks to new, fashionable shapes and attractively colored blossoms, the petunia is still one of the most popular summer flowers. In short, the perfect go-to gardening friend for sunny places. 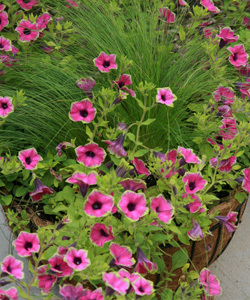 Petunias are a common addition to containers. Though generally treated as annuals by most gardeners, technically they are tender perennials and are members of the potato family of plants. 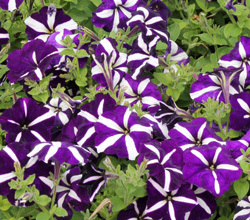 Today’s feisty hybrids are the descendants of two lanky, tiny-flowered South American species: the buff-white flowered Petunia axillaries and the night-fragrant, lavender to purple-flowered Petunia violacea. First discovered in South America in the late 1700’s these wild varieties quickly captured the imaginations of European breeders who began crossing them in search of the perfect petunia – a plant with large beautiful flowers in a variety of colors. 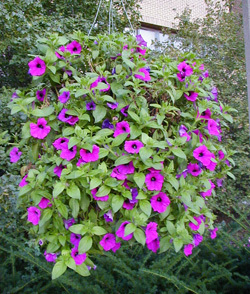 Petunias fill a hanging basket. A whole new world opened for petunias and their breeders with the development of the F1 hybrids. This made it possible to regulate their growth from the open, floppy forms to a bushier type with better weather resistance, an increasing range of colors and color-combinations and a far superior ability to weather the rigors of summer. As changes and improvements continued, plants started to be clearly categorized as grandifloras or multifloras. The first truly red petunia, a multiflora called ‘Comanche,’ bred by PanAmerican Seed, was introduced in 1953; and the first yellow, ‘Summer Sun,’ bred by Claude Hope, was introduced in 1977 by Goldsmith Seeds. As an interesting side note, petunias were among the first ornamentals to be bred specifically for the bedding plant market in the 1950’s. The ‘Madness’ series of petunia introduced in the 1970’s had grandiflora sized flowers but with multiflora weather tolerance, and in 1983 a new category was created by Ball Seed Company to describe them – the Floribunda. Then, a fourth class of spreading petunias was achieved by Kirin Brewery in Japan with the 1995 introduction by PanAmerican Seed of AAS Winner ‘Purple Wave.’ The original ‘Purple Wave’ series of petunias are easy to care for, flower freely, offer a thick, ground-hugging sea of color, need no deadheading, are incredibly weather resistant standing up well to rain and wind and are virtually disease-free, making the “delicate” landscape petunia a thing of the past. Blessed with masses of bright, richly colored, velvety blossoms along cascading branches, this spreading petunia is outstanding in hanging baskets, containers and garden beds. The original ‘Purple Wave’ has been joined by Easy Wave®, Double Wave® and Shock Wave® – each series sporting either larger, smaller or double blooms and more mounding or spreading habits. Another series, Tidal Wave®, is in an enviable class of its own. Referred by some as a Hedgiflora classification, it is the biggest of the Waves spreading to a whopping 5-foot diameter, capable of being trained up a trellis or a fence or mounded into a “bushy” plant, a vertical accent, a ground cover, or an exciting addition to hanging baskets, window-boxes, and truly tall containers. 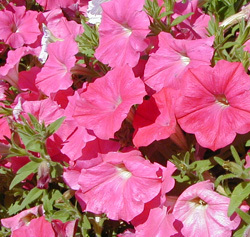 Other examples of popular spreading petunias include the highly acclaimed Supertunia®, Cascadiaä and Surfina® series. The “Wave’s” incredible success opened up an infinite ocean of exciting, new innovative characteristics and endless plant introductions in the world of petunias. New developments in petunia culture continue at an incredibly fast pace. Today color choices are nearly limitless, with some varieties sporting imaginative, vividly bold new colors, dazzling bi- and multi-color combinations, beautiful veining, innovative stripes and blotches, sharp picotee edging, engaging star shaped centers and colored throats. Plants offer enormous variety: single, double, large and small blooms, smooth or ruffled petals, mounding and cascading habits, and even some with fragrance. 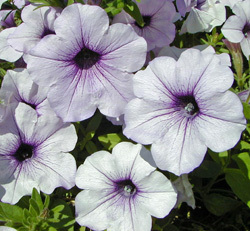 Unlike other grandiflora types that fade in the rain, Syngenta’s introduction of Petunia ‘Lavender Storm’ in 1966 dashed the sole objection against the big blossomed grandifloras – their rain intolerance. 1998 AAS Winner, F1 ‘Prism Sunshine’ bred by Floranova is noted for colorfast flowers that do not fade or discolor in the garden, and for its uniform compact plants that bloom early and heavily. 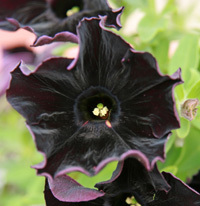 The first totally black petunia ‘Black Velvet’ was introduced Ball FloraPlant in 2011. Introduced 20 years ago, Suntory’s Surfinia® series reinvented the concept of gardening with petunias. Up till then, most petunias were produced from seed. Suntory introduced a group of very vigorous plants propagated by cuttings. 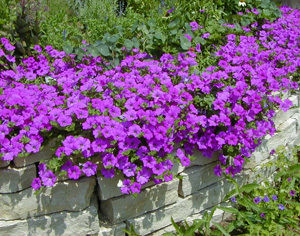 Available in four different groups: Trailing – the original Surfinias, excellent for beds and baskets; Mounding – bred specifically for large patio containers, they create an upright, full rounded mound of blossoms; Bouquet – are ideal for smaller spaces where compact growth habit with a high flower count is needed; and Double – a tight, mounding shape with extraordinary heat and rain tolerance and gorgeous, smaller carnation-like flowers that tumble and ramble over the edges of hanging baskets. Then there are the Supertunia® varieties that are vigorous, self-cleaning, well branching, heavy spring-to-frost blooms, surprisingly drought resistant when planted in the ground, and super easy to care for. One, ‘Supertunia® Vista Bubblegum’ kicks it all up another notch. Buried in an avalanche of hot pink flowers with red-purple veins, the plant makes an amazing statement in beds and borders. 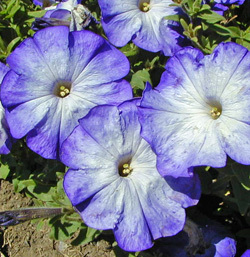 Introduced in 2012, Ball Horticulture Company’s Petunia ‘Blue a Fuse’ is a dazzling unique tri-colored combination of striking multicolored blooms in varying shades of violet, yellow and white with a deep purple throat. 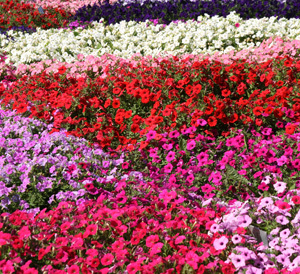 A new rising star in this vast sea of extraordinary petunia series is Petchoa ‘SuperCal®’. 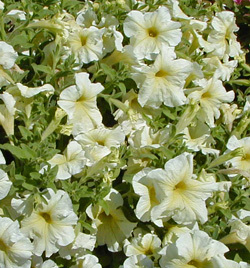 This vigorous new inter-generic hybrid genus introduced by Sakata Seed in 2008, is a cross of the closely related petunia and calibrachoa plants. While technically not petunias, the wildly popular Calibrachoa hybrids, or mini petunias, look and act like tiny petunias on steroids, and are sold under names like Million Bells, Superbells, and MiniFamous. ‘SuperCal’ is a milestone in plant breeding and the result is the ideal combination of the best characteristics of the two top selling species into one. From the petunia side of the family legacy, ‘SuperCal’ inherits strong roots, excellent plant vigor, large flowers and ease of growing. Its calibrachoa heritage is intense, vibrant flowers that hold up under severe weather conditions and its lush, non-sticky foliage that maintains a fresh, clean look without additional maintenance. These robust plants bloom from early spring through fall in an amazingly flamboyant display, need no deadheading and tolerate the South’s heat better than either parent. ‘SuperCal’ is an amazing plant for home gardeners who enjoy hanging baskets loaded with blooms all season long. And just when you’ve thought you’ve seen it all, hybridizers introduce exciting leaf colors into the mix. These new kids, HortCouture’s Glamouflage™ Grape – wide margins and marbling in cream and green – and Suntory’s Surfina® Variegated Baby Purple – trailing green and yellow leaves – are awash in bright purple blossoms adding new dimensions to stems cascading over rims of hanging baskets. As is quite obvious, in recent years the world of petunias has become a complex world, for there are – literally – hundreds of named petunia varieties. But a bit of advice for pairing the right petunia with your gardening needs can be summarized, in part, in the following manner. 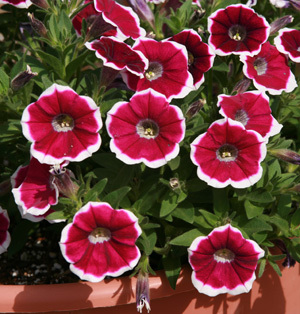 Grandiflora petunias with large flowers are available in many colors and patterns. Grandiflora: large-flowered blossoms (4-5”) consisting of both single- and double-flowering cultivars form mounds of colorful solid, striped, deeply veined, variegated or edged in a contrasting shade called picotee. Grandifloras prefer a cool, dry sunny environment in protected areas and dislike hot, wet or windy conditions, and work well in both containers and beds. Multiflora: compact plants with smaller (1.5-2”) flowers than the grandifloras; however, they bloom prolifically and freely all season long. These plants have single or double flowers and are available in a rainbow of colors, often with contrasting centers or stripes. Bred primarily for the wetter climates these petunias perform admirably in adverse weather conditions especially during very hot or very wet spells. Milliflora: petite, (1-1½”) blossoms produced with wild abundance that cover the plant with beautiful vibrant colors. Perfectly suited to containers, hanging baskets, miniature gardens and as edging plants, these delicate beauties bloom earlier, do not stretch, add fullness and contrast of size and color when combined with larger blooming plants. Spreading: low-growing plants only (4-6”) in height that can spread up to 5 feet across. These are fast growing plants with excellent heat and drought tolerance, require very little maintenance, and make excellent flowering ground covers. Their greatest popularity lies in their wild profusion of blooms that tumble out of hanging baskets, window-boxes and tall containers from late spring well into late fall in milder and warmer regions. Hedgiflora – one segment of Spreading: have growth habits based on how closely the plants are spaced in the garden. Grown close together, they form a dense, mounded hedge from 16 to 22 inches tall. Grown in restricted space with some support, they act like vines growing upward an extra 2 to 3 feet. But when given plenty of space to roam, they make a floriferous groundcover spreading 2½ to 3 feet. Floribunda: an improved multiflora petunia bred to have larger single- and double-flowered varieties that bloom earlier while producing an abundance of flowers. Like the grandifloras, they flower earlier, yet tolerate both hot and wet periods, perking up quickly after every rain shower. Floribundas are a fantastic selection for mass plantings in the landscape, and for container plantings in pots and hanging baskets. Petchoa (SuperCal): a combination of the best characteristics of the petunia and calibrachoa plants. The Petchoa ‘SuperCal’ plants deliver unique colors, sturdy blossoms and non-sticky foliage to overflowing hanging baskets. Petunia seed is very tiny, so starting your plants from seed may, at first, seem daunting; but it really is not all that difficult. The advantage of starting from seed is primarily a larger quantity of plants for less money. The main disadvantage is that many of the newer cultivars which are vegetatively propagated are not available by seed. Petunias can be started indoors from seed 10 to 12 weeks before the average last frost date in your area. For frost-free areas, count back from the date when you would typically be planting warm-weather annuals in the garden to arrive at your starting date. Use a commercially prepared soilless mix for starting seeds. Shallow containers are best, and should be clean with good drainage holes. Previously used containers should be washed in soapy water and then disinfected by dipping in a solution containing one part bleach and nine parts water. Fill the container with the soilless mix to within 1-inch of the top and press lightly to firm. If the mix is dry, moisten it before filling the container. Now tap the seeds out of the packet very gently, spreading them sparingly on top of the damp potting mix. Do not cover the seeds with the mix, they need light to germinate. Press them in gently with your fingers then water with a fine mist. Cover the container with clear plastic wrap or place it in a plastic bag closed with a twist tie to keep the mix from drying out while the seeds are germinating. Store the container in a bright, warm (70 to 80 degrees F) place, but not in direct sunlight, until seeds begin to sprout. This usually takes 7 to 10 days after seeding. When seedlings emerge, remove the plastic cover and place the container under fluorescent lights or in a bright, but cooler area of the house. Grow lights should be no more than 4 to 6 inches above the growing plants and should be left on for 14 to 16 hours daily. When seedlings have at least two sets of true leaves, transplant them into plastic cell packs, peat pots, or other small containers. To keep the plants from getting leggy, keep the seedlings under fluorescent lights or in a sunny window. Allow the potting soil to dry between waterings and fertilize every two weeks with a dilute fertilizer solution. 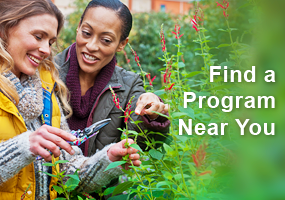 When they reach 6 inches in height, pinch back the growing tips to encourage branching. Harden off the seedlings by placing plants in a shady, protected location outdoors; gradually exposing them to longer periods of direct sun. Bring plants indoors if freezing temperatures are predicted. Petunias do best in full sun. If you have purchased plants from your local retailer, they will probably be in bloom, so you can easily see their colors. Look for healthy plants with clean, green foliage. 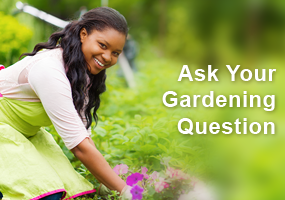 Avoid those with water-logged or dried out soil or any with pests and diseases like powdery mildew. Wait until soil warms to about 60 degrees F and the danger of frost has passed before transplanting. If possible, transplant petunias on a cloudy, breezeless day. If the weather is hot or windy with few or no clouds, provide some protection from the midday sun for a few days. 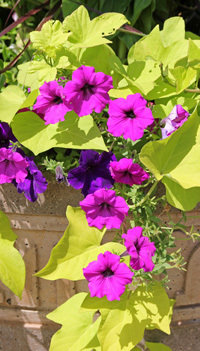 Petunias perform best in full sun, but can handle partial shade in the hotter parts of the country. They also require a moderately fertile, well-drained soil. Poorly draining soils often can be improved by incorporating organic matter, such as compost, peat or well-rotted manure into the soil. 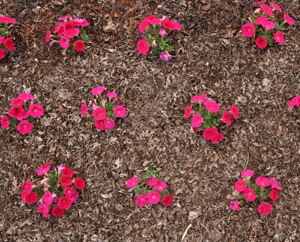 Space petunia transplants according to how much they will spread. Always check tags for planting instructions. 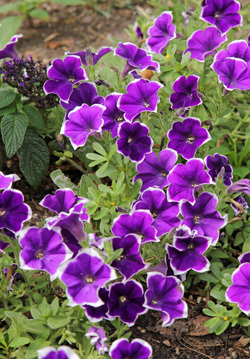 As a general rule, if planting in-ground, position petunias about 12 inches apart with the top of the soil at the same level they were growing in the nursery pots. Typically, the spreading types should be planted about 1 ½ to 2 feet apart. Older varieties of petunias require constant deadheading or they will get tall and leggy and stop blooming. Even some of the newer varieties will benefit from the occasional pinching or shearing in mid-season. Petunias don’t require a lot of care, but they do benefit from some attention. 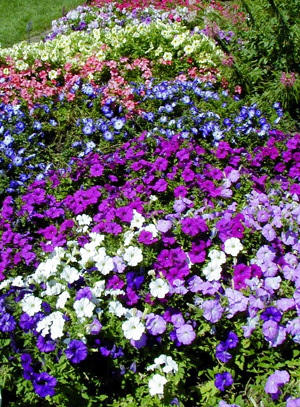 During dry weather, a deep watering once a week should be sufficient for petunias in beds and borders. Plants in containers, hanging baskets and window boxes will need to be watered when the soil surface becomes dry – on extremely hot, sunny days that could be daily – and fertilized every couple of weeks with a dilute fertilizer solution. Always check the cultural tags that come with the purchase of your plants. Many of the new cultivars are bred for compactness or mounding and require no pinching back or deadheading. Your cultural tags will give you this information. But as a general rule, to encourage additional blooms and improve plant appearance, remove the spent flowers on grandiflora and double petunias. This not only keeps plants blooming longer, it also keeps plants looking fresh, healthy and well groomed. 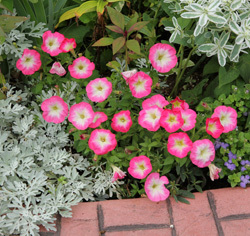 The smaller flowering types, such as the milliflora and spreading petunias are self-cleaning and don’t require deadheading. And although it isn’t practical to deadhead sweeping stands of petunias in the garden, it’s advisable to do so for plants in containers. 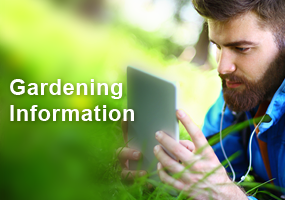 After pruning, fertilize and water the plants to promote new growth. Today’s newer cultivars are pretty much disease-resistant, but as with all plants, a few problems can develop and you will want to deal with them as soon as possible. Newly germinated seedlings can fall prey to damping off, a fungus that attacks at the soil level and is irreversible. The young seedlings will wilt and die almost overnight. Avoid damping off by using a commercially available soilless mix and use only clean, sterilized containers for starting seeds. Petunias generally have few pest problems. Young plants are susceptible to Botrytis, a fungus that is also soil-borne and spreads quickly from an infected plant to a healthy one. It thrives in cool, moist conditions, forming a powdery mold on stems, leaves and flowers. Watering only early in the morning, avoiding overhead irrigation and keeping plants spaced for good air circulation are all good ways to avoid these problems. 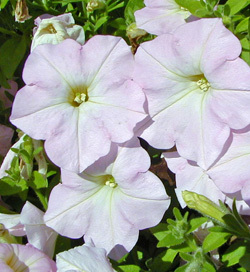 Petunias are also susceptible to various viruses which can leave foliage stunted and deformed with discolored and deformed flowers. The safest control is to remove and destroy diseased plants and keep aphids and other insects which can transmit the disease off the plants by hosing the plant with a strong blast of water. 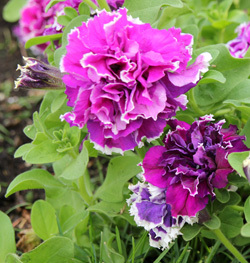 Petunias in the landscape can be bothered by different pests: flea beetles which eat holes in the leaves of the plants and the small, green budworm caterpillar which attacks plants in late June and July and feeds on the flower buds. Usually, you won’t see the actual caterpillar, but you should notice small black droppings and tiny holes in leaves. If you have a major infestation, apply Bt (Bacillus thuringiensis). 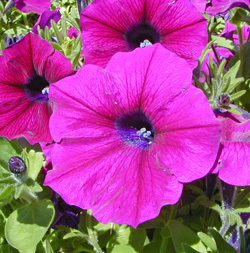 Petunia plants may look limp and scraggly after a hard rain; however, the newer cultivars usually perk up within hours. Most petunias have naturally sticky leaves and stems (some of the newer cultivars have this trait bred out of them), so don’t panic and think this condition is disease or pest related. — From the National Garden Bureau. The National Garden Bureau recognizes and thanks Betty Earl as the author of this fact sheet at http://ngb.org/year_of/index.cfm?YOID=3. My, my haven’t these plants gone through a lot of changes. I never knew they were a part of the potato group. I work at a greenhouse and hate when we cut the long plants, they are sticky and so is my hair when I get home from cutting and untangling the hanging baskets. Interesting article with a lot of information and history on petunias. Beautiful flowering plant, wish I could have more of them in my garden but I have a lot of shade. Guess I’ll be happy just enjoying them at the botanical gardens I visit throughout the year. I grow plants for many reasons: to please my soul, to challenge the elements or to challenge my patience, for novelty, or for nostalgia, but mostly for the joy in seeing them grow. This was a very good article, but I’m pretty surprised there was no mention of fertilizer. It’s been my experience that petunias are very greedy feeders. I will save the article and will be much better informed when purchasing from greenhouses this spring. I love the plant as it is low maintenance. They are available in so many colors and provide blooms from late spring until frost. The wave petunia’s are very popular in the garden center where I work. I love the self-cleaning varieties. The plant does best when watered regularly in dry times. Petunias can add a lot of color to a garden. It was interesting all of the varieties of petunias that are available. I will need to pay closer attention to information on the plants when I purchase them. Interesting article and history of this plant.